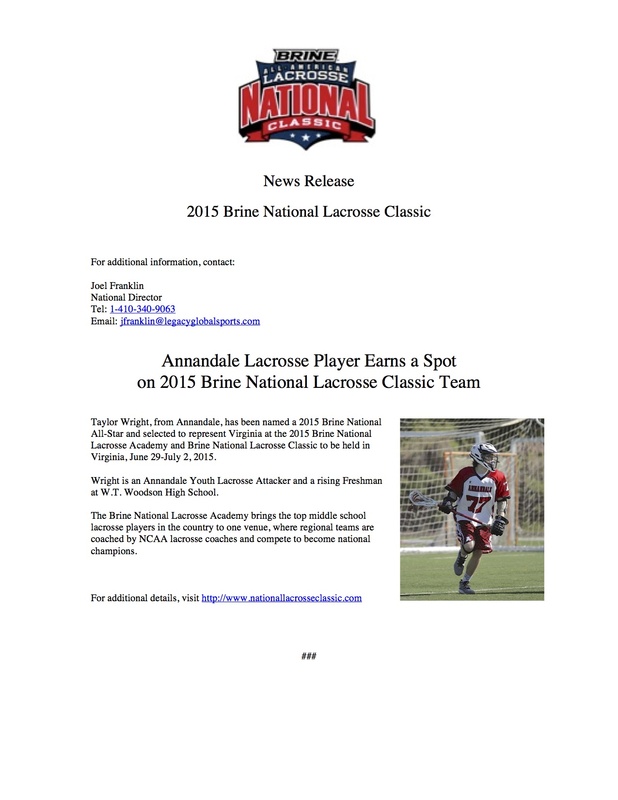 Taylor Wright, from Annandale, has been named a 2015 Brine National All-Star and selected to represent Virginia at the 2015 Brine National Lacrosse Academy and Brine National Lacrosse Classic to be held in Richmond, June 29-July 2, 2015. Wright is an Annandale Youth Lacrosse Attacker and a rising Freshman at W.T. Woodson High School. The Brine National Lacrosse Academy brings the top middle school lacrosse players in the country to one venue, where regional teams are coached by NCAA lacrosse coaches and compete to become national champions. Annandale Lacrosse is proud to announce we’ve received a Sportmanship Grant from US Lacrosse and the Positive Coaching Alliance for the 2014 Spring season! Through this grant AYL will receive two workshops hosted by PCA – one for our Annandale coaches and another for our parents. In case you’re not familiar with the Positive Coaching Alliance, this organization is the nation’s leading non-profit devoted to creating positive, character-building youth sports experiences. When you consider that over 70% of youth athletes quit sports by the time their 13 because it just “isn’t fun anymore” it’s clear something needs to be done to re-adjust our priorities as youth athletics coaches and administrators. PCA’s motto is “Better Athletes, Better People” and we at Annndale Youth Lacrosse share their goals of encouraging competitive play that also allows our athletes to grow as people and teammates. At Annandale Youth Lacrosse our motto is Practice Hard — Play Strong — Love Lacrosse. Join us for our 2014 Spring season and we’re convinced you’ll learn to love the nation’s fastest growing sport as much as we do! Registration for boys and girls, ages 7 to 14, is now underway. Go to http://annandalelacrosse.com for more information or email us at annandaleyouthlacrosse@gmail.com. Time To Register for ABGC Winter Programs! – The basketball fee includes clinics for 5-12 year olds. – The ONLINE registration fee of $41 ($46 signup at the office) is only for First Time players with the ABGC. – The basketball season is from December 2013 thru March 2014. – Parents will need to bring the paperwork into the main office at 4216 Annandale Rd., Annandale, VA to register. – The office personnel will register the players and the cost is $20/player. – Online registration is not available for this program. Indoor soccer will run from the middle of January to early March. (8 weeks).